Our Emily girl is NINE months old and acting more and more like a big girl every dang day. Why does life always seem to go so fast when it comes to our children? Has anyone done research on this? .You are tipping the scale at 22 pounds, 9 ounces. Which places you in the 95th percentile. .You are 27.75 inches tall and in the 45th percentile. .You are starting to thin out a bit but still have the absolute most delicious rolls to include your rubber band wrists. .You are wearing size 12 month and some 18 month clothing. For the most part the 18 month clothing is still too long on you. .You are in size 5 diapers to simplify moms life. Same size as your sister (who I swear I will potty train soon...). .You are a busy body in every sense of the world. You roll to get everywhere and need constant entertainment. Mama only gets a true break during nap time. .You sometimes take a 30 minute nap in the morning and a couple hour nap in the afternoon. Really depends on the circumstances. .You say "mama" and "dada". .You are starting to show an ornery side. Which greatly concerns mom and dad. We do have a Brooke after all. .You loved the wrapping paper more than the gifts at Christmas time. .You have started drinking out of a sippy cup. You are officially a bottle free baby (only using one 4/5 times as a baby). .You love the rattles you got for Christmas, chewing on a binky but not actually using it and your sisters. .You are so smiley and happy and have definitely developed your opinions, already. .You love grabbing other people and other babies by the face in a way to say hello. You get extremely upset if another baby doesn't let you grab their face. After all you are just trying to say hi. .You are still fairly easy going and easy for the most part only proving difficult in the middle of the night when you request nursing rights. Baby love. Mama adores you. You will forever be the baby and it is sort of like you know that. But your sweet snuggles and your crazy laugh give all of us life. You are such an incredible little human and you are so loved. To read about Grace at 9 months, click here. 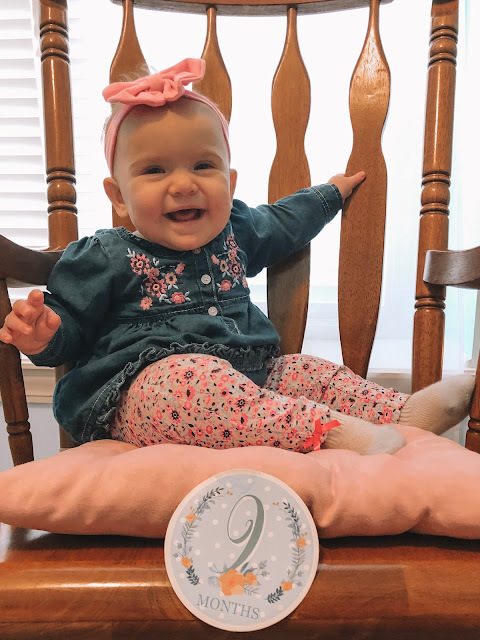 To read about Brooklyn at 9 months, click here. She just has the sweetest smile!!! :) I love her.